Ewing Center Hi Retro "Georgetown" Ewing Center Hi Retro "Georgetown"
Ewing Athletics is paying homage to Ewing’s career at Georgetown with the upcoming Ewing Center Hi Retro “Georgetown” colorway. Coated in a nice looking grey nubuck, the shoe of course gets navy and white accents all over. The Ewing Center Hi has been a hit-or-miss retro; people either love it or hate it. However, this colorway may sway more over to the “love it” side of things. Probably dropping for the usual $110, these are coming back in August, 2014. Are you happy about seeing more colorways of this 90s big-man shoe? 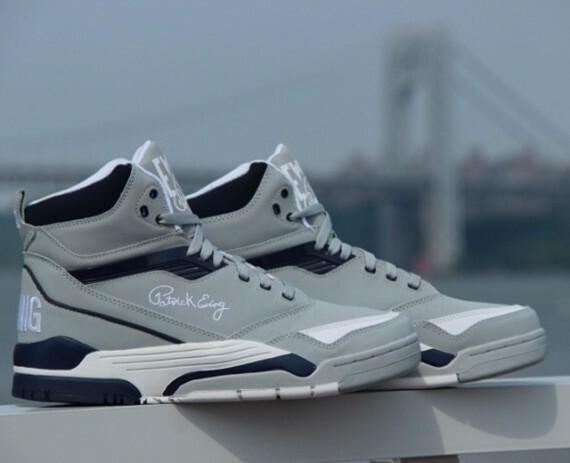 Share your thoughts on the Ewing Center Hi Retro “Georgetown” in the comments below.